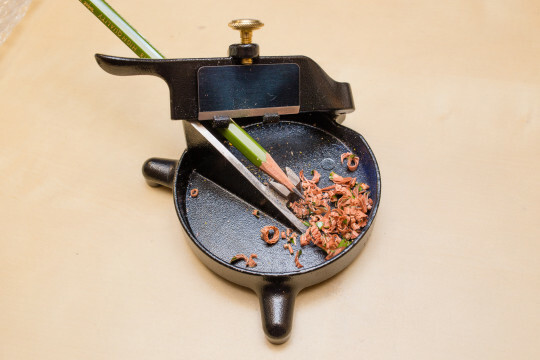 If you have come across this sharpener before it was most likely in How to Sharpen Pencils by David Rees (p. 103), but it also mentioned very briefly in episode six of the Erasable podcast. My interest in this sharpener got reignited when Sola mentioned it recently. My wife was kind enough to buy me this sharpener for my birthday. The official price is just under 50 Canadian Dollars, but unfortunately we chose the UPS delivery and I have to tell you, UPS is not exactly modest when it comes to fees. UPS shipping was about half the price of the sharpener, which is fine, but they made a really nice profit when they charged for handling customs clearance, plus they only take cash and don’t provide a receipt(!). It all felt quite dodgy (with no receipt), but otherwise they would have kept the parcel with the sharpener, which got really expensive by now. In the end, including all other costs, I paid quite a bit more than £70 (~$100; €100). 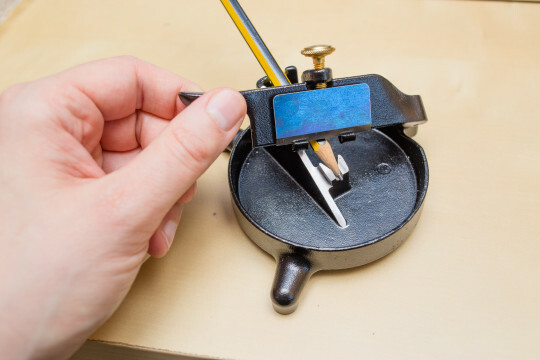 To sharpen a pencil you place your pencil in the support notch and move the hinged lever arm, similar to sharpening with a knife, to shave wood off. The lever arm is constructed in such a way that the blade cannot cut into the cast steel by mistake, as it will slide along what I can only describe as a sledge, the sledge will ensure you always keep the minimum distance from the cast steel. You then rotate the pencil, I think the official recommendation is you rotate it by 1/8 and repeat this step. To be honest, I’m not the most skilful person on the planet, but I am not exactly dexterously challenged either. I have no problems sharpening a pencil with a knife in a few seconds, producing a fairly nice point, but I really struggled with the Little Shaver. By now, several butchered pencils later, I achieve better results, but I still find sharpening with a good knife easier. I think my problems stem from three different sources. You might very well think that the sledge is there to keep the blade at the correct distance, when you sharpen the pencil, but it is (probably) only there to prevent you from ramming the blade into the cast steel support notch. You have to keep the right distance for optimal sharpening yourself. The first problem can be fixed by sharpening the blade. To prevent the pencil from moving forward, which was the second problem I listed, you can grip it very tight near the border of the sharpener. This will help to stop it moving forward. If you have a very sharp blade and don’t take too much wood off in one go it should be possible to hold the pencil in the right place and to prevent it from moving forward1. I guess dealing with the last problem requires some practice. Somehow I find it not that easy to keep the correct distance with the Little Shaver’s blade, even though I have no problems doing something similar with a knife. Based on other reviews of the Little Shaver I would say it can’t be too difficult, but then, if you think of buying the Little Shaver, keep in mind that these reviews are by people whose hobby is woodworking. 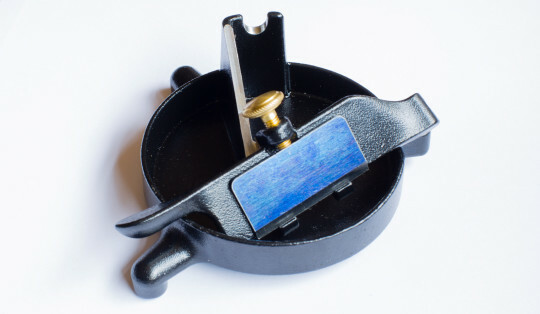 It’s one of the most interesting and unusual sharpeners that is still being produced today. As this is not a mass produced product the price can’t be very cheap, but there are much more expensive sharpeners out there, e.g. from Cara d’Ache, El Casco or Graf von Faber-Castell. I think I’d definitely buy one again if it wasn’T for all the fees associated with importing goods into Europe. What Lee Valley say in their YouTube video is certainly true: this sharpener has nothing to do with efficiency and more to do with fun and nostalgia. It is fun to use and there’s also the challenge of trying to produce a better and better point using the Little Shaver. If you liked or disliked this blog post, why not leave a comment? I’m always happy to read or reply to comments. As usual, please open images in a new tab to see them in high resolution. To watch the videos in full resolution please watch them on YouTube. You can find reviews of this sharpener at Popular Woodworking and Full Chisel. Since this blog post comes with videos: At Lexikaliker you can enjoy what I think must be the world’s first ever pencil blog post with a video. Thanks, Memm, for this great demonstration. I’ve been teetering on whether to get one of these (and yes, the UPS fees are part of the decision). Sean, I’m happy you liked it. When I ordered they offered about half a dozen different shipping options. There were also cheaper options than UPS. If you are in North America, it shouldn’t be too expensive, I hope. Sola, the Pound is quite strong at the moment, but don’t know about the CAD, but until I ordered I still thought the CAD is stronger than the USD, but that must have changed back quite a while ago. I’m happy I got this sharpener 8^) Unfortunately I cannot comment whether you can smell cedar shavings better as I’m not so well at the moment and can’t smell very well for now, but you’d think you can smell the cedar better with a more tradition (in this case modern) sharpener. Where did you get your sharpening stone? I did some searches for Belgian Blue and they were incredibly expensive (around 2x the cost of the little shaver in most cases). If you buy a big one it can get pretty expensive. Mine is a small one (about 10cm x 3 cm). I bought mine in a small shop in Würzburg (“Robert Schuchbauer”) that sells knives and related items (Google lists it as a Metalware Dealer). The photo of their old shop display from 100 years ago reminds me of your photos of old pencil display ( http://www.mainpost.de/regional/wuerzburg/Schuchbauer-Messer-bis-nach-Paris-geliefert;art735,5310932 ). I paid €16 for my Belgian blue, but I guess it would be cheaper online. I am tempted to get a yellow one, too. The exchange rate is very favourable at the moment. If I get one I will also get you one.